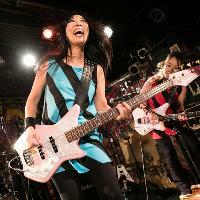 This Is Tmrw & Kushikatsu present Shonen Knife at the Hare & Hounds on Wednesday July 24th. To buy tickets for this event please visit the events page: Shonen Knife event tickets. Shonen Knife - from Osaka, Japan - formed in 1981 by sisters Naoko & Atsuko, long before terms like ‘riot girrrl’ and ‘girl rock’ entered the lexicon, the all-female trio were happily snapping guitar strings to the sound of imported Ramones covers. Like fellow cult Japanese girl group The 5,6,7,8s, Shonen Knife have weathered decades of musical change by adhering to what they know best: belting out their own infectious brand of feelgood pop-punk. Over the last 37 years they might not have packed out out stadiums but have been credited as a huge influence on alt rock acts from Sonic Youth to Nirvana Despite years on the road, their enthusiasm for live performances remains a joy to see as they delve into an extensive back catalogue ranging from solid thrash rock through to hit parade melodies. But key to their success has been a disarming, often slightly surreal, take on their punk and rock influences - and with songs titled Tortoise Brand Pot Cleaner could they ever be accused of taking themselves too seriously?